Taekwondo master Chae Teok Goh, who is a veteran leader in the Philadelphia Taekwondo world (honorary president of United States Taekwondo and Martial Arts Grandmaster federation), will be able to contribute to the Olympics in Korea and the development in Taekwondo. Taekwondo master Chae Teok Goh, recently received an appointment letter as an advisory member for the Pyeonchang Winter Olympics and a certificate of the National Assembly from Korean Taekwondo Union governor Dongseop Lee, (9th degree). They both participated in the Pyeonchang Winter Olympics public relations event for the business agreement conclusion for the development of Taekwondo between United States Taekwondo and Martial Arts Grandmaster federation, and the Korean National Assembly Taekwondo federation. Six people including master Goh received an appointment letter in this event held in the headquarters club of the United States Taekwondo and Martial Arts Grandmaster federation. As Hoyeol Kwon, Junku Lee, Bobby Kim, Woojin Jeong and Seongoh Yang were also appointed as an advisory member along with master Goh, these top veterans of the Taekwondo world, who live in America, will be able to play a major role for Korean Taekwondo development. 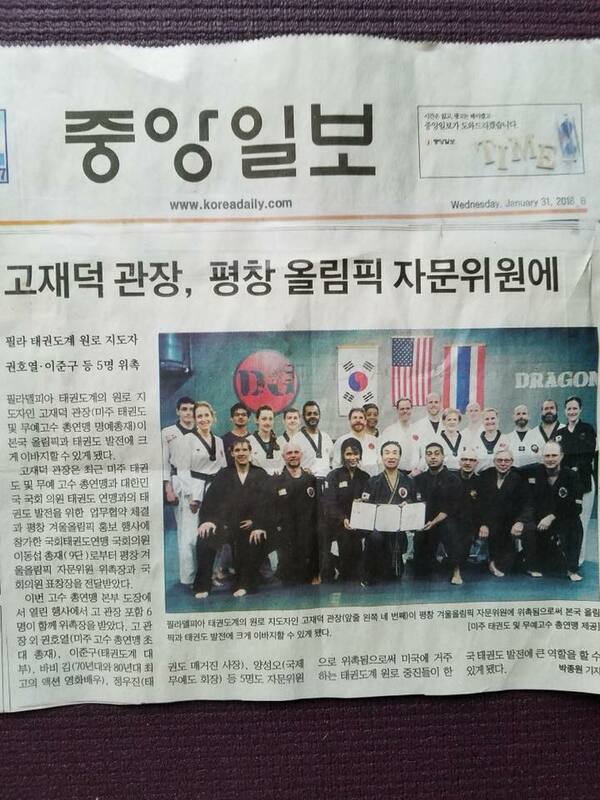 As Taekwondo master Chae Teok Goh who is a veteran leader in the Philadelphia Taekwondo world (front row, 4th from the left) was appointed as an advisory member for the Pyeonchang Winter Olympics, he will be able to make a great contribution to the Olympics in Korea and the development in Taekwondo.